If doctors prescribe generic drugs rather than their brand name equivalents, most times patients benefit. In last night’s federal budget, Treasurer Scott Morrison announced an anticipated range of measures to encourage doctors to prescribe generic medicines rather than their more expensive brand name equivalents. So unless specified by the doctor, patients will receive a prescription with the generic medication name on it. This is part of A$1.8 billion in measures announced to reduce the drugs bill over five years. But beyond saving costs, the push towards generics may also reduce confusion among patients and medication errors. “Are you taking aspirin at the moment?” I ask Iris, a pensioner in her 80s. “No dear, I haven’t taken that for years,” she says, as she empties a large brown paper bag filled with medication boxes, new, old and empty. I see a new bottle of aspirin emerge from the bag and ask if she is taking them. It’s not just elderly people who can be confused about which medication they’re taking. Drug names are long, complex and there are usually multiple brands for the same product. For any medication, there are likely to be up to 15 different brands available. People are likely to use these brand names to describe the drug, like Iris did with her Astrix tablets. In Australia in 2010 only 19.5% of scripts issued by GPs used the generic term for a drug, compared with 83% in the United Kingdom. Encouraging doctors to prescribe generics goes beyond economic value. It has the potential to lead to a simplification of the language around medications, less influence on our purchasing decision by pharmaceutical marketing, and fewer medication errors by both doctors and consumers. When we visit the GP, unless a specific reason exists, we should receive a script written with the generic term. What is a generic term for a medication? The generic term for a medication is the name of the active ingredient it contains. This is the ingredient that actually does the work of controlling your asthma or reducing your risk of heart disease. There is only one generic name for each medication. But several different brands may be available. The brand name is usually the largest writing on the packet. Nurofen, for instance, is the brand name for the generic medication ibuprofen. Generic medications are available for older drugs, and are commonly offered by your pharmacist as a cheaper alternative to the original branded medication. These drugs are tested to contain exactly the same active ingredients, so they produce the same effects. However, there are a few rare exceptions, such as in some epilepsy medications, where drug levels may differ slightly between brands. So in such cases, doctors can choose to prescribe the branded version for its specific clinical benefits. Explainer: how to generic medicines compare with brand leaders? Which medicine name your doctor writes on you prescription – brand name or generic – can often be a lottery. If your doctor writes a prescription for a brand name, your pharmacist may offer to substitute this for an equivalent generic drug. So, people often leave the pharmacy with a medication name or package that bears no resemblance to the prescription. 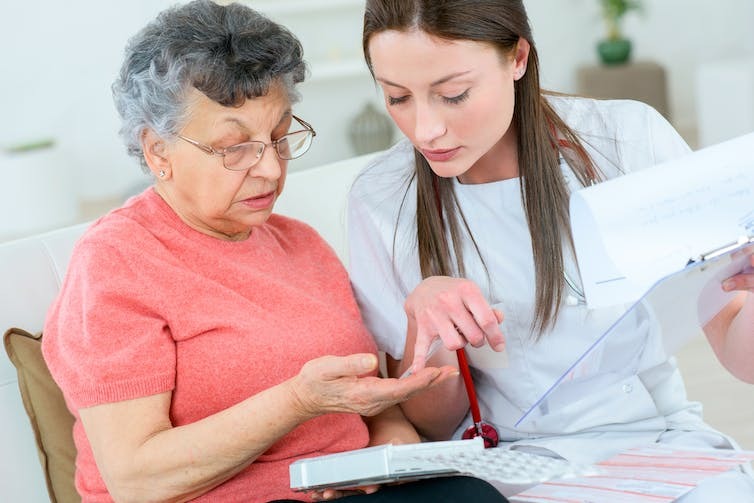 The main problem with all these multiple names is the potential for confusion, especially for those most likely to use multiple medications – the elderly. As a result, patients are at risk of not understanding which medications they are taking or why they are taking them. This often leads to doubling-up of a certain drug (taking two brands of the same medication), or forgetting to take them because the name on the package doesn’t match the script. This problem of some patients’ poor medication literacy significantly affects doctors, nurses and pharmacists, who need to know which medications people are using. While our own GP may have your list of medications, often we visit multiple doctors who won’t have access to these list (different GPs while on holidays, emergency departments or specialists). If patients doesn’t know their medications, neither will doctors. Many elderly patients are confused about the names of their medications. An advisory group for Australian pharmaceuticals, well aware of the dangers this confusion can cause, and as far back as 2005, promoted the use of prescribing and labelling with generic terms. The US Institute for Safe Medication Practices estimates that 25% of medication errors result from name confusion. Why do doctors use brand names when prescribing? In a busy clinic running half an hour behind, the generic name of a medication is often the last thing on the doctor’s mind. There are thousands of medications and even the most diligent doctor can’t remember them all. Pharmaceutical companies have marketed brand name medication to both doctors and (in some countries) consumers, so they are far more memorable and palatable – for instance Viagra, rather than the generic term sildenafil. But when doctors rely on using brand names in conversation and prescribing, this can cause confusion. 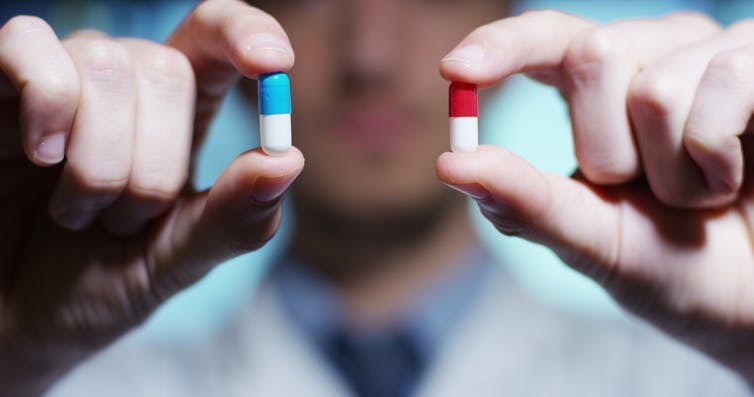 Doctors using branded prescribing can lead to serious medication errors. This may be due not knowing the active ingredients in those medications, or mixing up brand names, which are becoming increasingly difficult to recognise when written in doctor’s handwriting. So, to avoid confusion, medication errors and allowing for patient control over purchasing decisions, we recommend doctors use generic terms when prescribing unless a specific reason exists. Everyone uses medications. The key issue here is autonomy. A script that contains the generic term for a medication allows that person to decide exactly what type of medication they wish to purchase, rather than that be influenced by what brand the doctor writes on the script. When language excludes (for instance, by being complex or relying on jargon) or confuses, it restricts our autonomy. At present, the language of medications may have two, three or ten words for each drug, and the words we use are often influenced by pharmaceutical marketing and what a doctor prescribes. The greatest effect of this budget announcement may be the chance to simplify this language to a singular generic drug term, to reduce confusion and allow us to be more involved with our medication decisions.